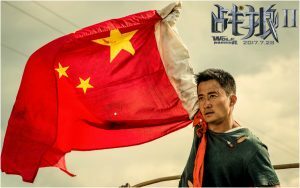 The latest Chinese feature film ‘Wolf Warrior II’ is currently hitting headlines around the world as it breaks China’s box office record for the highest grossing film in its history. It’s a great feeling for the team at Park Road as we had the pleasure of working with writer/director Wu Jing on the film’s sound post production. In 2016 discussions began during a visit to Beijing with producers Beijing Century Media Culture about Park Road providing sound design and final mixing services. After only a couple of meetings both parties took a leap of faith and agreed to work together. For the filmmakers it was a case of entrusting their film to a facility 18 hours flight time away in Wellington, New Zealand. They knew Park Road was a safe and highly reputable post house. But they wanted to know they would get our best and that we would deliver. For Park Road, we trusted that the film makers would get the material to us, and allow us to do our finest work. Both parties agreed that we were in it together .. and now Wolf Warrior II is the highest growing film of all time in China with a box office in excess of USD$760M. Not only that but is the second biggest single market film ever. And our response? Absolute delight. Our Beijing clients were a pleasure to deal with and have made a remarkable film. An historic film. And Park Road is proud to be associated with it. Director Wu Jing sent us a message of thanks! The sound editorial team was headed up by Chris Ward (dialogue supervisor), Hayden Collow (effects supervisor) and Stephen Gallagher (music editor), and two-times Oscar winning sound mixers Mike Hedges and Gilbert Lake pre and final mixed the 126 minute action packed war drama. Wu Jing and his team spent just under a week in the Park Road facility whilst finishing the final mix. Jing’s positive experience created a happy client and one very powerful film. China currently has one of the biggest film industries in the world supported by a massive movie theatre network and a keen movie-going public. Increasingly, Chinese production companies are tapping into expertise and talent in other countries to support their productions and depending on the project, add further value and experience to the final finish. This is the biggest Chinese release we have worked on to date and hopefully we will be working on another Chinese feature film here soon. Park Road is delighted for Wu Jing and Wolf Warrior II’s success and look forward to collaborating with them in future endeavors. Duty calls for former Chinese Special Forces operative, better known as one of the Wolf Warriors, as he is caught in the middle of a warzone in Africa. Riddled with guilt after the missing of his girlfriend, he escapes his violent past by beginning a nomadic life as the cook on a cargo ship. But as heavy rioting erupts in the small town of Africa during a port stop, the former leader of Wolf Warrior is thrust back into action. He must reaffirm his duty as a soldier and save the day once again as he faces civil unrest between rebels and citizens, a widespread viral epidemic, all the while protecting a small child he befriended. This action-packed thriller culminates into a climactic battle between Feng and his toughest adversary yet, a mercenary known only as Bid Daddy.